Apparently, during pre-human history, the Atlantic Ocean repeatedly covered the coastal plain and then withdrew, depositing layers of geologic material beneath the Pinelands. That is where all this sand in Whitesbog came from. This image was taken at Whitesbog Village in Browns Mills, New Jersey. I was walking with a group of photogs. We walked among a few square miles of cranberry bogs some of which are still functional. There are a few wooden pathways throughout the property at Whitesbogs. Some were still covered in ice and snow from the winter storm from a few two months ago. I was hoping to capture the feeling of cold and damp in this section of Whitesbog. The image was taken on a tripod with a remote shutter and ND filter. Three exposures were combined into one HDR image. I was attempting to bring out the flow from light to dark and to show how the sun was slowly turning a wintry area into spring. One challenge was in the placement of the tripod. I had originally placed the tripod on the wooden walkway. However, I soon realized that my colleagues who were walking my way were shaking the tripod ever so slightly. So I placed the tripod into the water just beneath the walkway. One thing I would have changed would have been the orientation of the camera. I think a portrait orientation would have worked better. I would have captured the part of the sky you see reflected in the water. 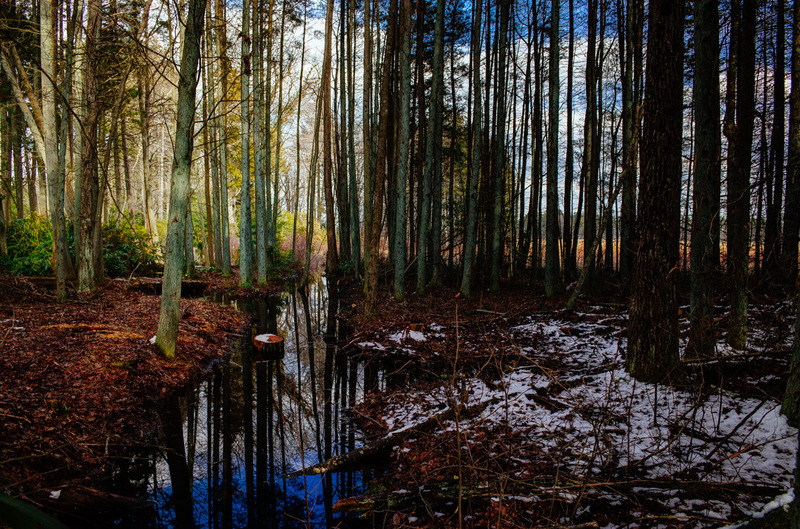 However, my 18mm (APS-C) was not wide enough to include the snow on the ground in the trees to the right of the water.